Old National Bank provides financial and banking services in Indiana, Illinois, Kentucky, and Michigan. It offers personal banking products and services, such as checking accounts, savings accounts and certificates of deposit, account management services, checking-related services, debit cards, direct deposits, and online and mobile banking services; and checking-related services, such as mobile deposits, bill pay, and checks. 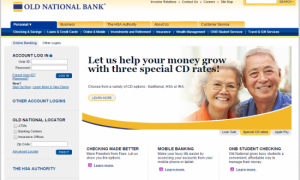 Step 1 – Customers of Old National Bank who wish to login to their account must access the banks Homepage and find the ´ACCOUNT LOG IN´ at the top left of the page.Users must next enter a ´User ID´ and ´Password´ in the blank fields and then click on ´LOG IN´. Step 1 – If a user can not remember their User ID or Password they must go to the top left of the home page where under the ´LOG IN´ they will be able to click on ´Forgot User ID´ or ´Password´. 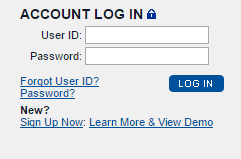 Step 2 – Users are directed to a second page where they will be asked to complete the blank field with their ´Logon ID´. 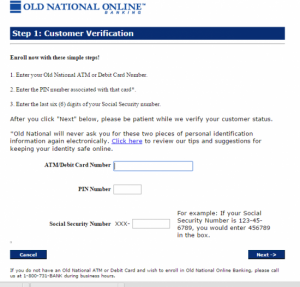 If Users still require assistance they may contact Old National Bank directly by calling 1(800) 731-2265. Step 1 – If account holders with Old National Bank wish to create an online account they must go to the banks homepage and click on the link ´Sign Up Now´ which can be found at the top left of the page below ´LOGIN´. Step 2 – Users are directed to a new page where they must complete the ´Blank Fields´.